Larry Robin, proprietor of the Moonstone Arts Center and icon of the local poetry scene. The nonprofit Moonstone Arts Center is entering a new phase. After 35 years of hosting poetry and arts events in Philadelphia, this longtime hub of poetry, education, and community organization on Saturday is throwing its first-ever fund-raiser — part of a planned expansion. As arts funding has become more professionalized, Moonstone has had to change with the times. 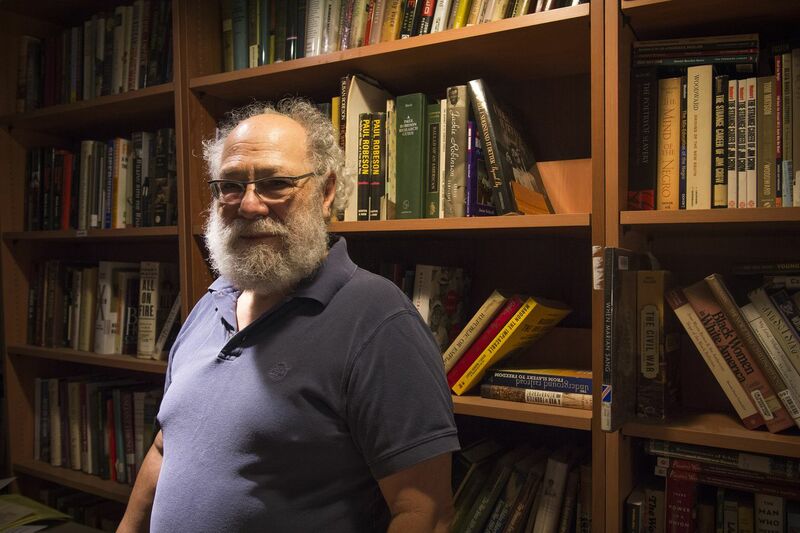 "You sort of have to grow up a little," says Larry Robin, who, as proprietor of the late Robin's Bookstore, cofounded Moonstone with his wife, Sandy. "In the modern world, a nonprofit has to act like a business: You have to raise your own. So we've created an advisory board, including people who know how to do these things a lot better than I do. We have created a publishing division, which is a money-making operation, and we're doing this fund-raiser." "Larry's been operating the center on a shoestring budget for decades," says Jennifer Stanton, assistant treasurer for the Moonstone Inc. board. She's also CFO of Communally, an antipoverty technology nonprofit. "We're trying to grow Moonstone into his vision – a large community arts center that serves everyone, all ages, all backgrounds." The fund-raiser, called "Sounds and Words," will be held at the District 1199C Union Hall on Locust Street, and is both a celebration of Moonstone as a Philadelphia institution and a homecoming for several major poets. Moonstone started in 1981 out of Robin's Bookstore, around the time Larry Robin moved the place from 6 N. 13th St. to 108 S. 13th St. He started presenting poets and writers, and Sandy Robin developed a series of Saturday morning children's programs. The nonprofit Moonstone Inc. was born in 1983, and ever since, the center has hosted readings, discussions, arts preschool, and school outreach programs, even after the bookstore itself closed in 2012. Larry Robin now runs the center from his studio at the top of the stairs. It's the kind of place that sparks gratitude and affection. Siduri Beckman, one of Saturday night's poets, was Philadelphia's first youth poet laureate in 2013, when she was only 14 and a student at Masterman. Now a junior at Yale University, she's excited about reading Saturday. "Larry and Moonstone Arts mean a lot to me," she says. Being the first Philly youth poet laureate brought its share of pressure and uncertainty, Beckman says. "Larry organized so many events for me to become comfortable performing my poetry for strangers and then later professional poets and critics." She also praises Robin's knack for bringing together "incredible groups of people that demonstrate the diversity of Philadelphia art in a thousand different forms." Moonstone is a busy place. In the last year, it has hosted 87 poetry programs involving 411 poets and thousands of attendees. Its publishing wing, Moonstone Press, has 50 titles in its catalog, including, in the past year, 14 anthologies and five collections by poets. Every Wednesday evening at Fergie's Pub, there's a Moonstone reading. Every first Tuesday night at PhillyCAM, there's Philly Loves Poetry, a local TV show on poets and the poetic art. Every third Monday night at South Philadelphia Library, there's New Voices: Philadelphia's Emerging Poets, for artists under 25. Each year there's Poetry Ink, an anthology of local poets, and the 100 Poets Reading, a day-long poetry marathon. (Full disclosure: This writer has been part of several of these events.) And so on and so on. At Sounds and Words on Saturday, jazz sax man Bobby Zankel and his Wonderful Sound 4 will start things off, and woodwinds man Elliott Levin and band will close it out. In between come the words, from a diverse array of poets, including keynoter Sonia Sanchez, the city's first poet laureate and a recent recipient of the prestigious $100,000 Wallace Stevens Award from the American Academy of Poetry. "We're trying to represent different age groups, styles, ethnicities, and genders," Robin says. "That's what we've always done: We want you to hear people you might not otherwise hear. We have older poets, younger poets, political poets – and I think they're all terrific." What Moonstone does best: a packed house for an event in September at the Museum of African American History. "The truth about brother Larry," says Sanchez, who turns 84 on Saturday, "is that for years he's been central to the arts in this town. He does chapbooks, conferences, contests, all sorts of innovative ideas, including the annual Celebration of Black Writing," which Moonstone hosted for 18 years. "At his core, he loves poetry, saying poets and poetry are central to our humanity." Zankel, who will also accompany his spouse, poet Sekai'afua Zankel, at the event, goes back a long way with the arts center. "Really, you have to be asleep not to be a fan of Moonstone," he says, "for the sheer amount of great works, books, publications, poetry readings, and conferences they've contributed to our city. It's like jazz: People don't think a lot is going on around here, but a lot really is. Anywhere you are in Philly, you're three blocks away from poetry." Sounds and Words fund-raiser, 7 p.m. Saturday, Nov. 10, District 1199C Union Hall, 1319 Locust St., $35 general admission ($50 reserved), moonstoneartscenter.org.